You will know by now that we are eating more and more vegetarian meals at the moment. We are loving this new healthier way of eating so naturally this week it had to be the vegetarian meals that really stood out! At this time of year I enjoy more comforting foods like stews and bakes. With lunches I am constantly looking for new ideas and new ways to make lunch a little less boring. It always seems to be a meal which I grab quickly while doing things around the house and sorting the twins out. With these two thoughts in my mind I have selected two delicious lunch ideas and two warming, evening dinners. Thank you to everybody who joined in with CookBlogShare last week. As always it was lovely to see the regular bloggers but again, last week, we had some new bloggers join in which is lovely. I hope to see them return as the regulars do. First up is the deliciously healthy lunch from Only Crumbs Remain. As soon as I saw Angela's Squash, Quinoa and Goats Cheese Salad it was an immediate must try. I love everything about this dish, I can just imagine how well all of the flavours marry together. Next up is the perfect, winter comfort food Curried Root Vegetable Stew with Chilli Coriander Dumplings from Allotment 2 Kitchen. This week I have got planned a similar meal using beans and root vegetables. I love the earthy, sweet flavours that root vegetables bring to a dish and with the addition of the dumplings with extra spice I bet this is a fantastic comfort meal. My next lunch recipe is from Candace's Kitchen. Her Chilli, Sweet Potato and Butternut Squash Soup would make the perfect lunch on a cold day. The combination of sweet potato with the butternut squash gives a lovely sweeter soup, then with the added chilli to give you a kick of spice and heat it will be sure to warm you up. Served with a fresh, homemade bread roll you simply cannot go wrong. Finally I chose this Baked Barley Risotto with Butternut Squash from Family Friends Food. I have used pearl barley in the past as a substitute for arborio rice and found it to be so full of flavour and texture. This recipe has me craving to make a pearl barley risotto. I usually cook it on the hob but after reading this recipe I will be having a go at making a baked version. 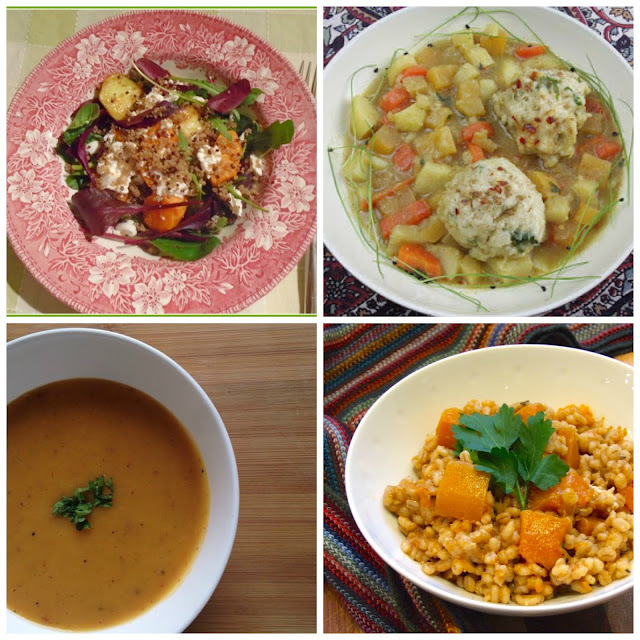 I am sure that you will agree that all four of these recipes look and sound so flavoursome. They leave you hungry for more! Thank you for sharing them, and all of the other recipes that were linked up last week. This week the CookBlogShare linky is with Mandy from Sneaky Veg. I hope to see you and your lovely recipes there.